Bad weather and low temperature can cause delays to construction and industrial maintenance activities. Although at Rhino we are best known for our scaffold shrink wrap film, this is not the best solution for every temporary weather protection problem. In particular, once shrink wrap has been installed, it cannot be re-used or moved to another location. Fast Tent System is a rapid set up, portable, inflatable work tent, that is designed for use in construction environments where weather protection or temperature control is required. The modular system uses self supporting inflatable ‘air beams’, no work at height is required, which allows for rapid deployment and easy relocation. The system’s double flame retardant skin, also provides superb insulation. Modules are available in widths from 4m to 18m. Fast Tent. Why is it different? 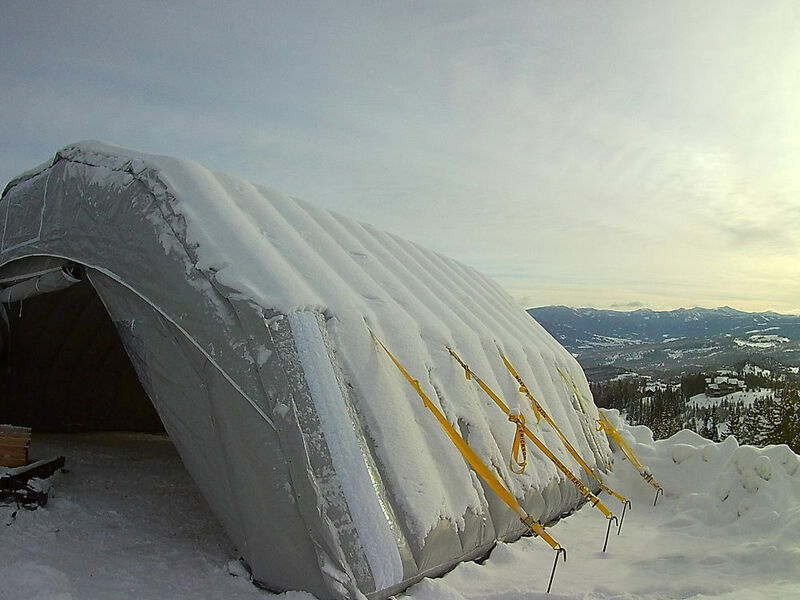 Fast Tent is a rugged & re-usable weather protection & environmental containment system. The system is designed to withstand high wind & snow loadings. Modules can be installed on any terrain and in any weather. The inflation process takes just a few minutes. Fast Tent is ideal for short term protection or where frequent relocation is needed. The effectiveness of most tenting & sheeting systems is dependent on the skill of the installer and weather conditions during set up. Since each Fast Tent module is manufactured and tested off site, consistency and quality is ensured. This also means we can incorporate colours and corporate branding. Fast Tent provides a quality solution to protect work areas from poor weather & low temperatures. As Fast Tent is self supporting, no scaffolding frame is required and work at height is eliminated. 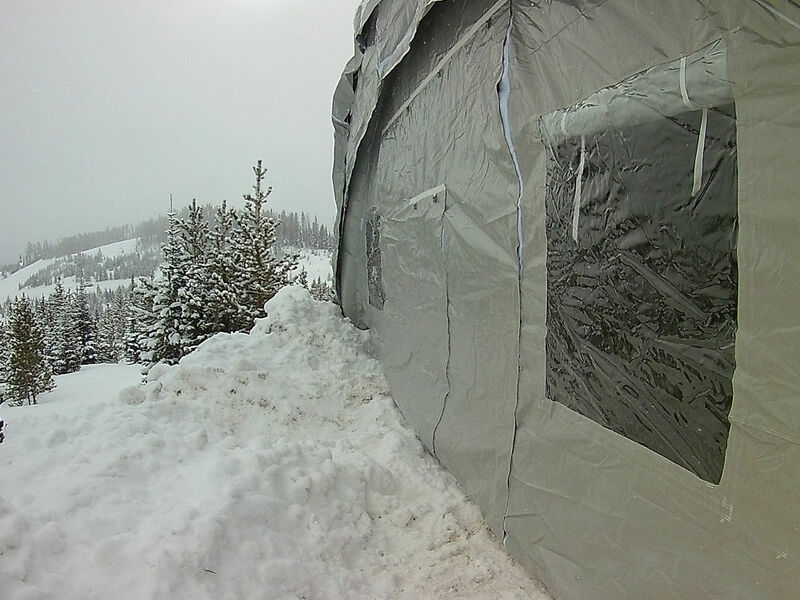 The system’s inflatable skin provides insulation and easier control of the internal environment and because a Fast Tent is re-usable there is no sheeting to be disposed of. Fast Tent is a safe and sustainable solution. What is Fast Tent constructed from? Fast Tent is constructed from a heavy duty PVC coated fabric which is flame retardant to BS5438 part 2. How is the construction tent inflated? Air blowers are powered by a 110v supply and inflate the tent up to around 4 psi. With this design of tent, the fans are inflate and then maintain a constant pressure. The fans are rugged and used to running constantly, in some applications continuously for many years. 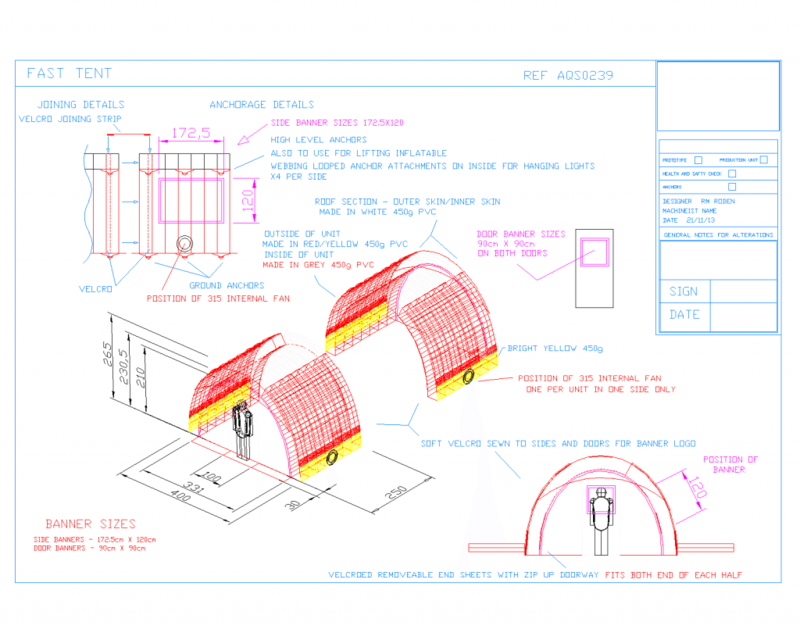 What size of tent can be constructed? 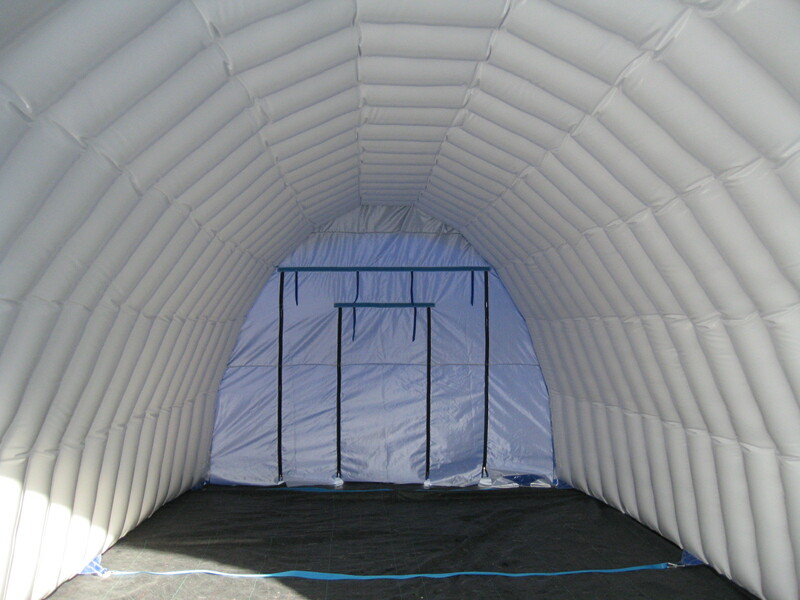 This tent is 4m W x 5m L and in two sections which can be used independently or joined. The airbeam system can be used to encapsulate areas as large as a ship’s flight deck, or as small as a one man work habitat and the concept is designed to be modular, so different elements can be combined to suit the local environment. As you can see, it makes a completely sealed solution. This particular design has inflatable side walls and roof but not ends, mainly because of economy and also it makes the tent a little lighter. How resistant is Fast tent to high winds? 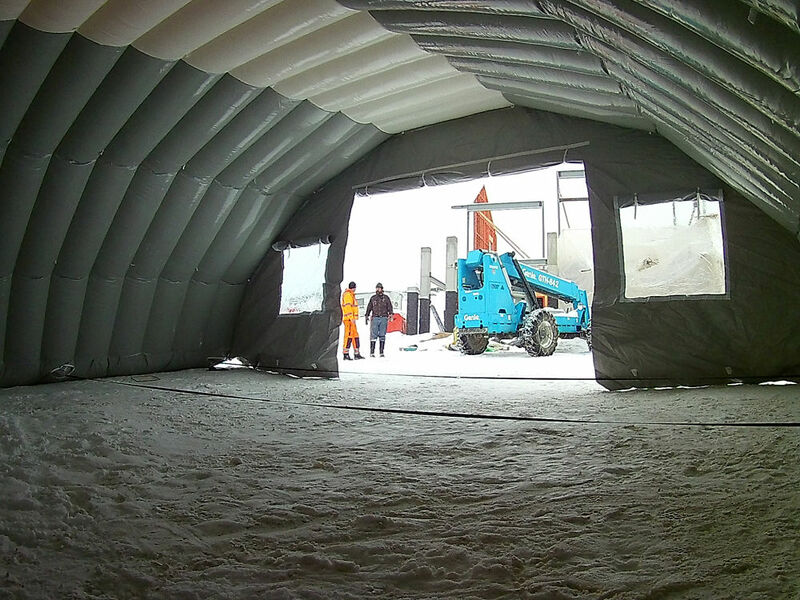 The double skinned construction provides great stability in high winds but also provides a high degree of insulation. In addition, tie downs enable the FastTent to be strapped down. Alternatively, balast can be incorporated around the skirt. Inside, there are fixing points for lights. Can I have my logo included? Custom branding means that each construction tent can be used to create a powerful message on behalf of the company. Replaceable branded panels, applied to the sides of the tent can also be used for safety messages. How easy is it to move a Fast Tent? Very easy. To move a Fast Tent, it can be deflated and rolled up or once inflated, it can be easily lifted by hand. Is Fast Tent available to rent or buy? For a discussion of your requirements, contact us and we’ll help you identify which Rhino Fast Tent product might be right for you.